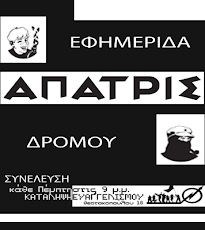 On Tuesday 22-07-08, the squat of Evaggelismos received a visit by a coterie of officials, constituted by the dean (and businessman) of the university of crete, the vicechancellor, the local prosecuting attorney and some high-ranking cop, along with undercover cops and pressmen. Aim of this visit was, in their own words, to "warn us" for the oncoming evacuation of the building and "give us a two-week deadline" in order to abandon the squat. 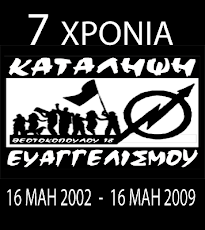 During the next day, this was carried on the local papers; they were praising the squat's intended evacuation and its future exploitation, carrying out their familiar tendency on misinformation and mudslinging; with sensationalism and without mentioning what will be accomodated in this space in the case of an eviction. We know that their main concern is the building's evacuation (during the favorable to them coincidence of a repealed university asylum and the summertime), instead of its future use. In any case, only some naive would lap up that such a "filet" in the city centre would not be used by the university or the local municipal authorities (in case of a building tradeoff between them) for speculative aims. 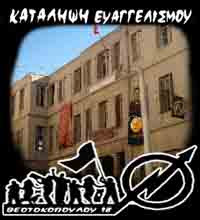 On May 16th, 2002, a team of young people, mainly university students but also workers and high schoolers, occupied the long-since abandoned building of Evaggelismos, in the city center of heraklion, number 18 on Theotokopoulou Str. Our aim was and always is to create a space of communication, political and cultural expression, independent from any "formal" institution (university, municipality, state, political parties, etc). Feeling that the existing forms of political and cultural expression do not serve our turn and having already the daily experience of petty-politics hypocrisy that these institutions carry with every aspect of their existence (like the dull knowledge that its unique aim is to produce more human exploitation, or that farcical examinational process, the electioneering phenomena, up to the reasonless political dialogue between press releases and political party gatherings), we chose to squat this space, remaining independent from all kinds of "institutional" frames. Squatting has its own history, in greece and all around the world; history that opposes factually and straightly to the proprietary rationale which considers the existence of empty and (for a long time) unused buildings a preferable choice (instead of i.e. having to deal with utilized spaces by teams or individuals with housing requirements). When it was first squatted, the building was in an indescribable situation after a (more than) twenty years long abandonment. Used needles and rubble of all kinds were removed and with no special knowledge or financial support, a whole transformation of the space took and takes place, just by the squatters working on it. Among the activities of the house are a self-organized cafe, a bookshop that works on a free-exchange basis, open discussions, screenings, several concerts and theatricals that are held within the squat regularly. During those 6 years, Evaggelismos via a constant gathering that takes place every Wednesday and functions in a non-hierarchical base, has produced speech and action over a series of concepts, local and environmental issues like the opposition against the scheduled destruction of a local park, actions against the construction of a local transit harbor, central political matters with attendance in student and other mobilizations, autonomous actions against racism and commercialization of public spaces, solidarity actions for the political detainees, supporting the prisoners' struggle against the prison system, and many other activities. and these are bothering matters.. Naturally, this type of action is by no means favored by the local administrators of authority. 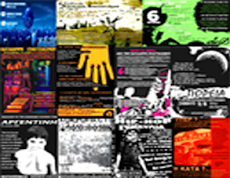 Thus we have occasionally been found confronted with repression in its "classic" form, judged for the organization or attendance in mobilizations related to the solidarity shown to detained demonstrators and the reaction to a in-cold-blood murder of a 22-year old man by a cop during a roadblock, back in 2003. Following the above, various "well-wishers" have undertaken the process of "informing the world" about Evaggelismos. Local politician-followers and ambitious penny-a-liners do not drop a chance at mudslinging the space and the persons using it. Jabbering always leaves traces on the public opinion. Therefore, whoever relies and feels "informed" being a passive brainwashing receiver (there's a plenty of them out here), learns that this ain't a proper place to hang around, as long as (under those pseudo-literal statements) drugs and gun dealings take place in there, orgies and rooms letting too (well, that was the topper). Our only reply is our permanent action plus the posters and proclamations that circulate occasionally, calling people in scenes. and this discomfort will carry on.. The last and more serious threat of evacuation coming from the deanery and the district attorney's office in heraklion, won't cut off our course. We do not intend to surrender our labors and this six-year old story in the hands of a dean, specially when he's tangled up in financial scandals and brings up himself as an absolute university monarch. Besides, this recent decision of eviction is induced exclusively by the deanery, without the existence of certain requirements by other members or bodies of the institution. In the event that the police forces attempt to vacate the building, the only person in charge of any consequences and by any chance wounds will be the dean and only him. Our city is not in need of another stocking and pasteurized venue, but free social spaces. The city center reformation and its derived "profit sharing" won't come over us. Evaggelismos is existent and will keep going on, as long as there are people who won't fit themselves into the lifestyle of misery, people who deny to live a predetermined life, following lifepaths shaped by others. It's a point of convergence on individuals and opinions that oppose to the extant, an open social space in a city and society where everything is sold and bought, where every human expression and activity presupposes some compensation (pecuniary or not), where the human work is an object of exploitation and the surplus value tops up the bosses' pockets. We want to make clear that whoever undertakes to throw us out of here will have a hard work to do, in which somebody will have to dig his hands into the dirt and someone to be charged with the political cost of the aftermath. To anyone concerned, any stance talking about 10 or 20 squatters is just a misbelief. 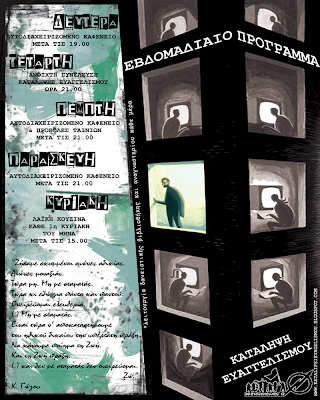 Evaggelismos is surrounded by a wide number of people and organizations that know how to fight and how to resist to such threats.